Motorsports equals speed and punishment on vehicles. The faster you push, the closer you are to the limit of your car’s ability to hold together. 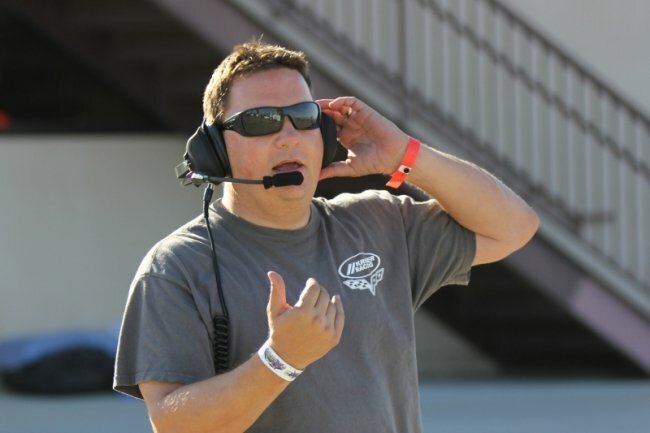 With racing, we know eventually stuff breaks, that’s just Motorsports 101. The goal is to upgrade and maintain your vehicle to avoid failures on track. One place you certainly don’t want to have a problem is at the hub of a wheel. If a wheel goes “bye-bye” then chances are you just lost steering ability, and worse, braking ability. This is a very bad thing. In this situation, you are no longer the driver of a car, you become merely a passenger of a crash-test vehicle, waiting to run into something hard. So, for obvious reasons, one of the first upgrades for any racecar is stronger wheel studs. Stock wheel studs were designed by auto manufacturers to withstand soccer moms running into curbs at five miles per hour. They weren’t built to handle the rigors of wheel-to-wheel racing. Here you can see a stock Honda wheel stud (top) versus its ARP equivalent (bottom). Another advantage to longer and stronger wheel studs is the ability for tune-ability with track width. Here you can see the red arrow is pointing to a 10mm aluminum wheel spacer which pushes the wheel out from the hub. This makes the car’s overall foot print wider and thus the car is more stable. This wheel spacer would not have been possible with the stock wheel studs as they were too short. In motorsports, different sized tires are always one of the biggest things continually changed in the ever present quest for better lap times. In order to get a certain width tire on a vehicle and still have inner fender clearance, wheel spacers are often used to makes things fit. The only way you can safely use a wheel spacer is by lengthening the wheel studs. And the wider the spacer is, the more you are asking of the longer studs in regards to strength and holding power. This is another no-brainer reason to upgrade studs as these are easy to swap out parts. 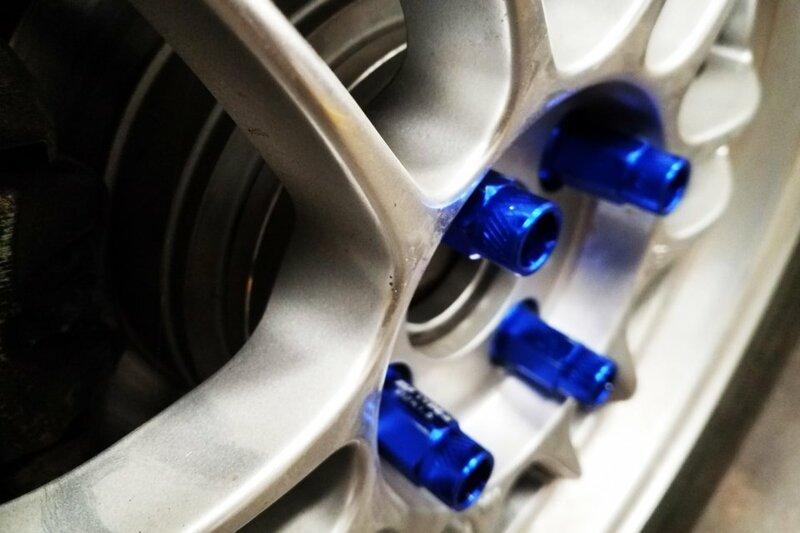 To off-set the additional rotational and unsprung mass of your new longer and stronger wheel studs, you can choose to purchase some 7075-Aluminum lug nuts. The reason these lug nuts can be made of lightweight (and soft) aluminum is because of their length. Once installed, you will have twice the amount of threads on the wheel stud compared to your O.E.M. lug nuts. Longer wheel studs provide more options when it comes to lug nuts. There is a huge aftermarket selection when it comes to lightweight alternate metal lug nuts of varying colors. I have found during 10 years of road racing that aluminum lug nuts (if carefully installed and torqued correctly) work just fine. I like my lug nuts to be softer than my wheel studs, so if there is going to be a failure when changing a tire, like a cross thread situation, it is quicker, easier, and cheaper to replace the lug nut than it is the wheel stud. To illustrate how to install your own upgraded wheel studs we will demonstrate the process on a 1993 Acura Integra NASA Honda Challenge racecar. The installation of wheel studs is not a complex job, but it takes a few steps and the right tools. The first thing to do is to remove the hub assembly so we can access the wheel studs with a press. For pressing out the studs I have seen this job done with a simple ball-peen hammer and a fair amount of cursing. My suggestion is to use a press. You don’t need a fancy air-actuated hydraulic press, an $80 press from Harbor Freight works just fine. Before you get started, make sure the new studs you purchased are the correct thread and pitch for your application. For our project we used ARP’s M12x1.5 for Hondas. You don’t need a bunch of expensive fancy dies to use a press. Use what you have in your toolbox to get the job done. To press out these stock wheel studs we just used two same height sockets (see arrows) to hold the wheel hub in position while the press did the hard work. Once you figure out the best way to hold your wheel hub in place, so the press can push the stock wheel studs out (we used sockets), then you can go through the process of pressing each stud out of the hub. Ensure you make a note of which direction the old studs pressed out so you can put your new studs in the same, and correct, direction. For pressing the new studs in, we used a single socket that was longer than the studs themselves which allowed for the stud to go into the hub with ease. This is one of those moments where assembly is honestly the opposite of disassembly. Flip the hub over and press the new stud into the hub. Ensure the stud is pressed entirely into the hub or you will have lug torqueing issues. A good practice is to torque your lug nuts after every track session to ensure the studs have been properly pressed in and seated. All finished. Four stock studs pressed out and four ARP studs pressed in. Ready to go racing. The whole project to do all four hubs set us back approximately $200 total ($30 per stud kit per corner, plus we purchased an $80 press from Harbor Freight). If you already own a press then you have saved cash there. Total time for the project set us back about two hours. Some people choose to hammer out their old studs (destroying them in the process) and then use a lug nut and washers to pull the new stud into the hub. We do not recommend this process, as in most cases you will need to torque the lug beyond 130 foot-pounds to get the stud to pull into the hub. You are asking the threads of your brand new studs to do more than they are designed for. Our advice, do it right, and press the studs in. All that is left to do is go fast!